Shandy was off to his new life (after attempting to exit the buyer’s horse trailer through the escape door) and I needed a horse. 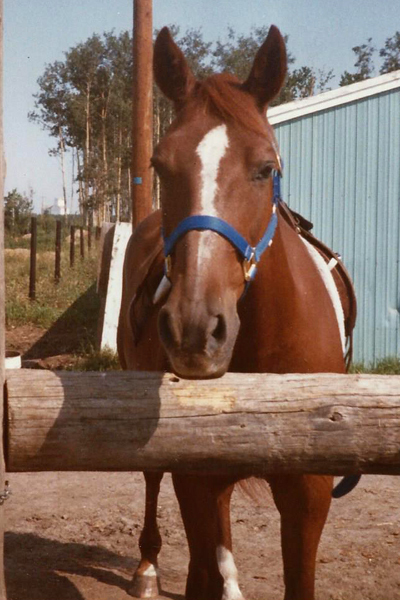 I don’t recall just how many horses I looked at or tried but I clearly remember going to see Bonnie. She was owned by a fellow Charlie Lake School alumni, who I knew but not well since she’d been a couple of years behind me. There’d been rain, but I wasn’t going to let a muddy paddock deter me from my goal–a horse for the upcoming jumping lessons, clinic, and horse show being hosted by the North Peace Light Horse Association.